Alert for Fibo Retracement and Fibo Expansion levels. Sound, Mobile and Email alert. Up to 20 Fibo Levels. Continuous sound alert every few seconds till a user clicks on the chart to turn it OFF. Single sound alert with pop-up window. Keeping all user settings even after changing timeframes. New handy menu to change Fibo settings easier. Auto bring the chart to the top of other charts when alerting. Fully customizable, including Fibo level's values, colors, levels that you want or you do not want. Add indicator to the chart. 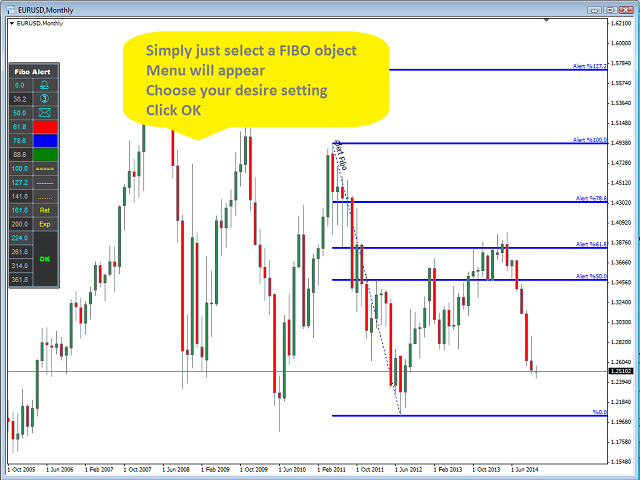 Select any Fibo Retracement or Fibo Expansion object on the chart. The indicator's menu will appear on the left side of your chart. Choose your desired color, levels, style and click OK. In case the chart is behind other charts and is not visible, it will come to the foreground automatically. Indicator will start continuous sound alert. So, in case if you were not at your computer at the time of alert, you will not miss it. A Mobile and Email notification will be sent. Indicator will change the Fibo level description to "Was Hit", so you will not get an alert on this level again. When a trader clicks on the chart, continuous sound alert will be OFF. Bring the chart to the top: When a Fibo level was hit, it will bring the chart to the top of other charts automatically. Continually sound alert: When a Fibo level was hit, the level will keep blinking and continually alerting till user clicks on the chart.